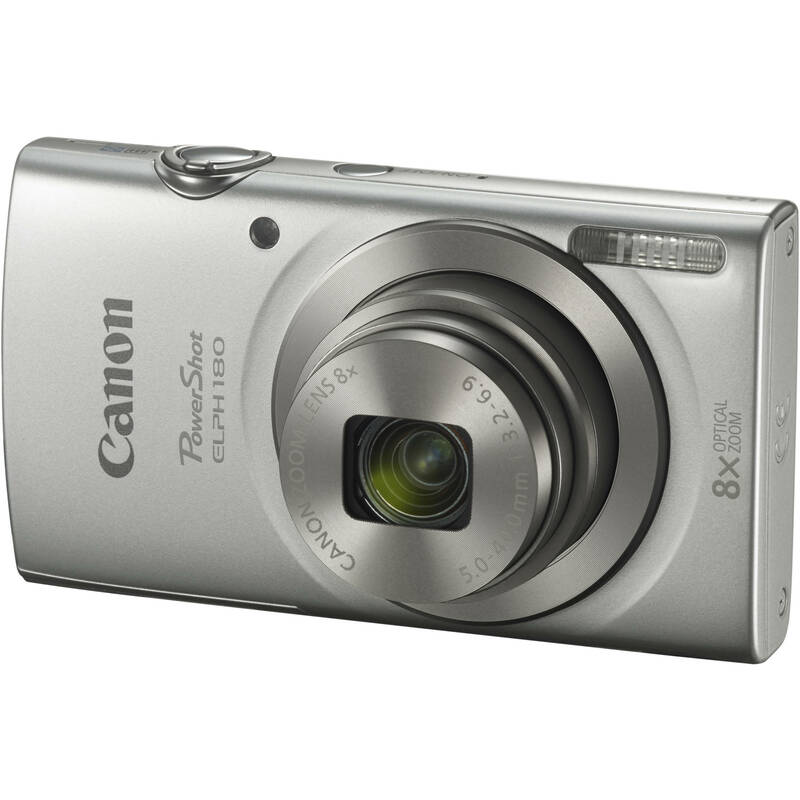 High-resolution shooting in a compact, portable form factor, the silver PowerShot ELPH 180 Digital Camera from Canon is a convenient point-and-shoot featuring a 20.0MP 1/2.3" CCD sensor and DIGIC 4+ image processor. Together, the sensor and processor offer notable image quality for stills shooting as well as HD 720p video recording at 25 fps. Complementing the imaging capabilities, an 8x optical zoom lens covers wide-angle to telephoto perspectives to suit shooting in a variety of locations. This lens is also benefitted by Digital IS, which helps to minimize the appearance of camera shake for sharper handheld shooting. Additionally, the camera's sleek design is complemented by a 2.7" 230k-dot LCD for image playback and live view monitoring, and a host of shooting features are available to intelligently select exposure settings, creatively adjust the look of imagery, or to simply learn more about how to use all of the shooting controls of the ELPH 180. Box Dimensions (LxWxH) 4.4 x 3.1 x 2.3"
PowerShot ELPH 180 Digital Camera (Silver) is rated 4.3 out of 5 by 28. Rated 3 out of 5 by Anonymous from Great Value I purchased this camera to document fixtures and job information in a manufacturing plant. It is a decent camera for the price to have out on the shop floor. The zoom was better than expected. This is used primarily as macro shots and close ups. I was amazed at the level of detail it can capture once I took my time and selected macro mode. Pros: Good zoom Macro mode Many effects for different situations Rechargeable battery SD Card compatibility Compact size Fast from power up to taking a shot Cons: No USB port (Need a card reader) Not many options in manual or program mode. Auto focus can sometimes not pickup subject immediately. It may take a try or two to get subject in focus. Rated 5 out of 5 by youyou from worth to buy I bought this toy for my daughter. It is really good for a beginner. My daughter likes it very much! It is light and easy to handle with. the images are clear. Rated 2 out of 5 by Anonymous from Focus Issues This camera was purchased for the exclusive purpose of taking pictures of products we sell online. Unfortunately, the camera is unable to get a sharp focus (even though the pictures were taken in a controlled well lit tent). The shots were taken on a tripod from 18-24 inches away from the item. The writing on the label of the item is illegible and therefore useless for our purposes. We tweaked a fair amount of settings to trial and error with no avail. This camera may be useful in other applications. However it was useless in the above example. Rated 4 out of 5 by railfanbs from Simple Camera for a senior citizen The camera was just what my friend needed. She is in her eighties and just wants a camera to take pictures and this one proved very god at that. A few simple instructions about how to work the camera and she was off and running, more or less. Rated 3 out of 5 by JP from Compact and Convenient I was looking for a compact camera that I can easily drop in a pocket and pull out at a moments notice. The PowerShot fits that bill. I have an IPhone with great camera but was looking for additional camera for events and trips. In Automatic Mode is a quick point and shoot for those spontaneous moments. I particularly like the Wide Angle Mode that provides an approximation of a 16:9 aspect...like the way the photos look in that mode...comes with an battery wall charger that folds up for travel and you supply your SD card...all very light. Rated 5 out of 5 by fdelarac from Canon's best very good image resolution. Easy to handle. good quality video with sound. It is good buy without investing a lot of money. Rated 5 out of 5 by GramGram from Just what I needed. Just use it for casual pictures. I have been experimenting with it and it seems very easy to use.I went online to research the manual for something and it has a lot of information. The only thing I don't understand is when I go to do a redeye correction it tells me it's busy and can'y modify and I don't find and explaination .Is it me or the camera? Otherwise it seems very simple and convenient size. is it compatable with apple products and whats in the box ? Is this camera compatable with Windows 7 ? Yes, this camera is compatible with Windows 7. What is the body of the camera made of? Metal or plastic? This camera is made of plastic and metal. Does this camera have a date and time stamp feature? Yes, this camera has a date/time stamp feature. what stores carry the camera? defiantly in B&amp;H. reliable and great. Does this camera come with a manual? Comes with a multilingual manual. English Spanish and French. Hope the information helps your requirements.